Do you need my actual bouquet or just a photo to work from? No need to send me your bouquet, those beautiful flowers won't last. I simply need 1 or 2 high quality photos to work from. It is preferable to have photos from your photographer but I can work from photos taken from a smartphone. If you select my Honeymoon Package* your photographer won’t have had time to edit your photos so you will need to arrange for a photo to be taken by either yourself or your maid of honour and have them send it me. Most smartphones these days provide high quality, anything above 3MB is wonderful and will give me the detail I need. Diamond Package sizes start from 24" - Most popular. Platinum Packages sizes start from 30" - Premium, statement pieces to pack a bunch. Best hung above a couch or on a feature wall. I have a round bouquet what size would you suggest? I have a draping or wide bouquet, what size would you suggest? I suggest draping or wide bouquets be painted on rectangular canvases. The landscape canvas works beautifully above a couch or the head board in the master bedroom. I would suggest a canvas size of 18" x 24" for a small space or 24" x 36" for above a couch/headboard. Standard commission turnaround time is 6 weeks from the date the initial deposit is paid. If you require the work faster you can opt for the Honeymoon Package* upgrade or pay a rush fee. Please do let me know if you need it earlier. What paints do you use? I use high quality Golden Acrylics and Dulux Paints. For the detail areas I mix the Golden Acrylics with a painting medium to allow for better flow and greater detail. 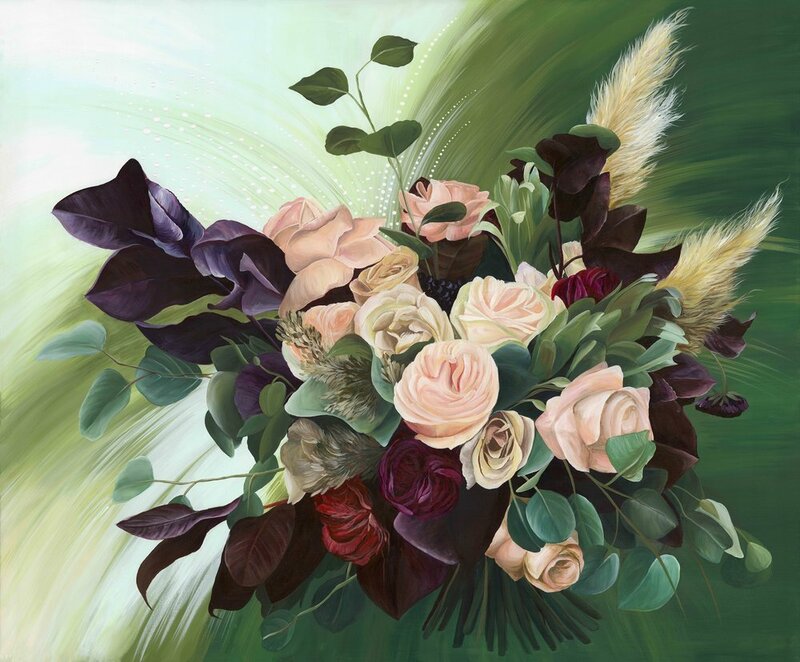 What type of painting surface can I have my bouquet painted on? Paper - For the budget conscious, I can paint your bouquet on heavy strength 600gsm paper. I would suggest you had the painted framed in glass to protect it should you choose this option. Sizes start from A3. How do you protect the painting from dirt and dust? Once the painting is dry I protect the painting with an isolation coat to seal the acrylic paints underneath. On top of this I seal it with a gloss varnish. This protects the painting from dust and also makes the painting colours appear richer and deeper. Over the years dirt and dust will stick to the varnish rather than the painting and when the time is right, the varnish itself can be removed and the painting re-varnished to look as good as new. How do I hang the work? Hanging hardware will be installed on the back of your painting so it is ready to hang. Do I need to have the painting framed? I paint the sides of the canvas and round boards to suit the colours of the painting. Therefore they do not require framing. However, it is a matter or personal preference. The right frame can certainly finish the piece off and add the finishing touch to the work. My works tend to look best in wooden or white frames. Shipping costs are additional, and these are dependent on the size of the painting and your location. I work with trusted shipping companies and take out shipping insurance to the value of your commissioned piece. I sure do! As a fellow New Zealander now living abroad I continue to have clients across the ditch. Bridal Bouquets of A3 size on paper can be shipped flat. Works on canvas over 30” will need to be removed from the stretcher bars and shipped rolled in a tube. You will then need to arrange for the painting to be re-stretched at your end. For more information of international shipping please contact me.